Byrne Robotics: What coulda been, what shoulda been, what will never be AT ALL! Topic: What coulda been, what shoulda been, what will never be AT ALL! I was flipping through my JLA/Avengers comics the other day and, fabulous Perez artwork aside, I found myself getting VERY nostalgic (and not for the first time) for something that NEVER existed: the 1980's never published JLA/Avengers comic. As excited as I was for the Busiek/Perez JLA/Avengers that did see publication in 2003/2004 - I didn't seem LOVE it as much as much as many of my contemporaries. While the artwork was, again, fabulous, the story seemed to me to lack warmth, passion, and any scintilla of simplicity. Anyone else have any almost were/never published comics that they would like to share with the forum? Please limit your list to comics that were actually in the pipeline, so to the speak (e.g., JB originally being slated to do art chores on X-MEN/ALPHA FLIGHT would count)- do not include fantastical comics that you just WISH were going to be published. I would have loved to see the version of God Loves, Man Kills that Neal Adams was going to draw. The Miller Dr Strange would have been fun to see. I own that deluxe version of the 2003/2004 JLA/Avengers - it's a slipcase edition hardcover (2 books, I believe) - and, no. What was published were all the penciled pages (never before published in one place before) Perez had completed for the project prior to its cancellation as well as the outline of the story in a per page, short paragraph synopsis. Anyone else have any almost were/never published comics that they would like to share with the forum? Does the rest of JB's run on The Incredible Hulk count? If so, that'd be my pick. I absolutely loved what was already published and it kills me that the rest of the story was never told. After reading this announcement following WHAT IF? #36, I figured JB must've had a bunch of stories swirling around his head. And I want to read them! I have a feeling it's just as well we never saw it, but I've still long wondered what Kirby would have done with the All New Savage Silver Surfer had the title not been cancelled with issue #18. I've said this before: nothing has been more disappointing to me than the abrupt end of the Stern/Byrne Captain America run. It would have included a dying world being strip-mined to death (16), a battle with the High Evolutionary, who would have been revealed to have destroyed Counter Earth after Warlock's departure, and a team-up with Gamora against Drax The Destroyer. Another one to lay at the feet of Marvel editoral. Phillip, have you seen Marvel Masterworks: Warlock #2, which included 16 pages of "Just a Minor Incident" by Jim Starlin and Alan Weiss, intended for Warlock #16? The rest of JB's Avengers West Coast run. The rest of John Byrne's Hulk run and the second Cold War mini-series. The JLA/Avengers deluxe set had all the remaining art from the 80s Avengers/JLA It was about 15 pages, uninked and uncolored. Beautiful stuff, but it only got through the first chapter and a half... all that was ever done as I recall. Mr. Byrne's FF without powers would seem to me to be, effectively, the Challengers of the Unknown (ref. Amalgam's "Challengers of the Fantastic.") That's not a complaint; I would LOVE to see Mr. Byrne's take on the Death Cheaters! It seemed to me that IDW's "Byrne Super-verse", with Trio and Helix, had many more stories to tell, and I would have loved to see those. 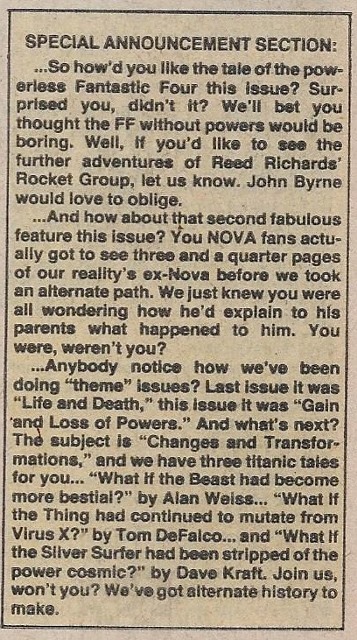 In general, most of the Byrne books that got cut off - Captain America, X-Men (although Elsewhen whets the appetite! ), Fantastic Four, the Hulk, etc. I really wanted to see the OTHER ending to Crisis on Infinite Earths. I talked to a couple of DC pros who said that if sales and response weren't good on COIE, there was a storyline to revert everything back to "status quo." Mr. Byrne has noted that he had a storyline to go from "Whatever Happened to the Man of Tomorrow" to "Man of Steel" organically; not simply a dead stop and restart; but a story that reverted everything naturally. It sounded great! JB and Chris Claremont's "What If...Magneto Had Formed the X-Men?" JB's announced FREAKS series for DC. 1. The X-Men/Legion of Superheroes crossover by Claremont and Cockrum, circa 1982. When DC's New Teen Titans book took off and unexpectedly became DC's best seller the Titans were swapped out for the Legion, and Dave dropped out of the project. Seeing Dave draw the two teams he made famous would have been amazing. 2. Howard the Duck revival series circa 1986. After Gerber settled his lawsuit with Marvel he was slated to return with an all-new Howard the Duck series. He wrote the script for the first issue (a parody of Secret Wars, Crisis, and "event" stories in general) but Shooter asked for changes that Gerber wasn't willing to make, so he took his script and walked away. JESUS--I understand Frank Miller was intending to do a life of Christ comic, but was derailed by 9/11. As a Christian, I find that both intriguing and scary at the same time. Nonetheless, I think his SIN CITY art style mixed with 300 would have fit the desert-set epic quite nicely--I mean, I can practically picture the whole thing in my head! SPIDER-WOMAN--I've mentioned this before, but Mark Gruenwald's relatively short run of this Los Angeles-set series is one of this LA native's all-time favorites! He and Carmine Infantino somehow got the weird feel of my home town just right. I guess at Shooter's order, Mike Fleisher and then Chris Claremont wrote 180 degree takes that weren't even the same character. Gruenwald was heartbroken as he had plans for 100 more issues (some of which, I assume, he used on his 120+ issue run on CAPTAIN AMERICA). SUPERBOY & THE LEGION OF SUPER-HEROES--Jim Starlin's follow-up to his brilliant issue #239 (possibly my all-time favorite single comic issue) was supposed to be a big special with twice the pages but was instead whittled down by the new editor to two regular issues, inked by the totally inappropriate Dave Hunt, prompting Starlin to call himself "Steve Apollo" and never go near the Legion again. In hindsight, 239 and the sequel would be the type of thing to forever be reprinted in all formats (including oversized hardcover "ultimate" or "artists" editions) and possibly spawn a billion-dollar movie. But, hey, editors have to show artists who's boss every so often, right? So was I. Based on the Book of Matthew, which I figured would mess with people’s heads, as the story told there is quite different from the “Fifth Gospel” so many believe. Roger Stern getting to carry out his plans for The Avengers (to me the only misstep Mark Gruenwald ever made). Love it or loathe it, Peter David being allowed to wrap his Hulk run up with issue 500. I would have loved to see DC's New 52 reboot not happen. Geoff Johns didn't want it to happen but he got overruled. acquired...I would have been interested in seeing what they did with that.